Howdy, folks. Sorry about the delay in writing. It appears as if life snuck right up on me and bit me in the behind. 😉 Really, that’s basically what happened. But it was worth every minute. Let me start by saying that our holiday was amazing. I spent a few days with my boys, have been able to get things pretty well back in order and have even enjoyed a minute or two to myself. Hard to believe, I know. And then I traveled to San Antonio, TX, for the American Farm Bureau annual meeting. 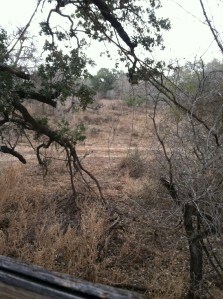 And I took the opportunity to go hog hunting with a friend of mine. And although I was not successful, in the most basic definition of the word, it was an experience that I will never forget. 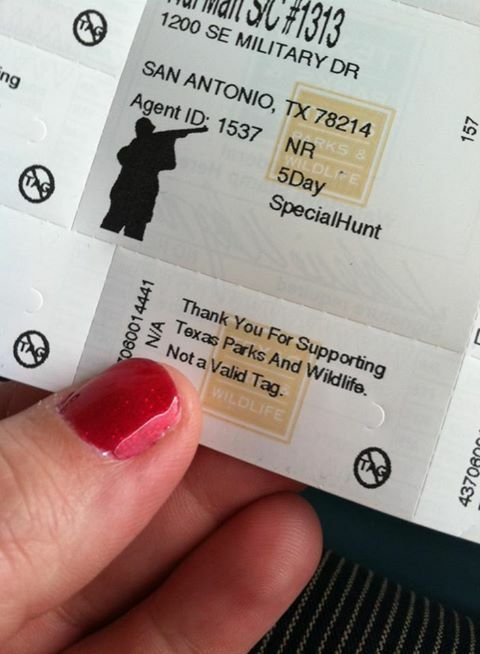 This was my special tag for hunting hogs in Texas. Really. Truly. I didn’t think it would happen. And yes, I did the nails, just for the hunt. Let’s just say that I don’t believe that Miss J and I could ever do anything the “easy” way. It’s always an…adventure…to say the least. And this was no exception. The details in the hunt are really not that exciting. We sat in a blind, in the dark, for roughly six hours. We saw a few pigs that were located close to us, but to our left and slightly behind us, in the blind spot of the blind, you may say. Add to that the fact that I had never used a night-vision scope, and well, let’s just say the pigs are still happily destroying Texas countryside. But our discussions were interesting. And there was a moment when an acorn dropped on the roof of the blind (steel roof, mind you), and Miss J believed for a split second that I had shot my gun. No, the trip was definitely laughter-filled. And when we wrapped up, right around 11, we knew that it was an experience worth having gone through, even if we didn’t do it again. And then the story becomes even more interesting. You see, Miss J and I were dropped off some 20+ miles south of San Antonio at a gas station by a cab driver. He had been driving us around most of the day, and was willing to come back to get us, but he didn’t answer his phone. So we get dropped off at a gas station, in the middle of nowhere, with no cab driver, and a guide that was ready to go home. And the gas station was closed. And our guide didn’t like to go into town. What do we do next? We call the yellow cab company. Problem solved. Send someone our way, we’ll be on our way back to our hotel. Except we weren’t. The cab company never sent anyone. And finally…finally…it was decided that our guide would at least get us closer to town. Which is a step in the right direction. Because, really, what choice did we have? All in all, the trip was amazing, even though nary a hog was shot. The story itself is so remarkable that few would believe it from beginning to end. But that’s the way real life is lived…just on the outskirts of believable. This entry was posted in Hunting and tagged American Farm Bureau Federation, bucket list, hog hunting by wagfarms. Bookmark the permalink.